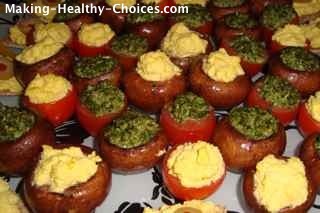 These stuffed mushrooms are a healthy appetizer that are delicious and a great crowd pleaser. This is a completely raw and vegan recipe. For the best tasting results, use organic, fresh ingredients and always start all your recipes with LOVE (all recipes taste better if they are made with love). Combine marinade ingredients in a large bowl. Follow the recipe for the pesto sauce, found here. AND add the mushroom stems that have been marinating into the food processor and blend them into the pesto sauce. Follow the recipe for the cheez sauce, found here. 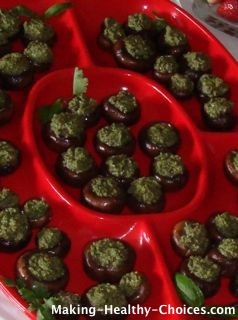 Next, stuff the marinated mushroom caps with whichever stuffing you chose to make and arrange on a platter for serving. If you made both stuffing recipes then you can enjoy arranging a colorful platter with your two varieties of mushrooms. Serve with a smile and enjoy!